Last week I was at my favorite conference of the year — the Net Inclusion Conference. Held in Charlotte, North Carolina, the conference brought together policymakers, practitioners, academics, and executives who are all passionate about closing the digital divide. In its fourth year, Net Inclusion keeps growing and continues to impress. 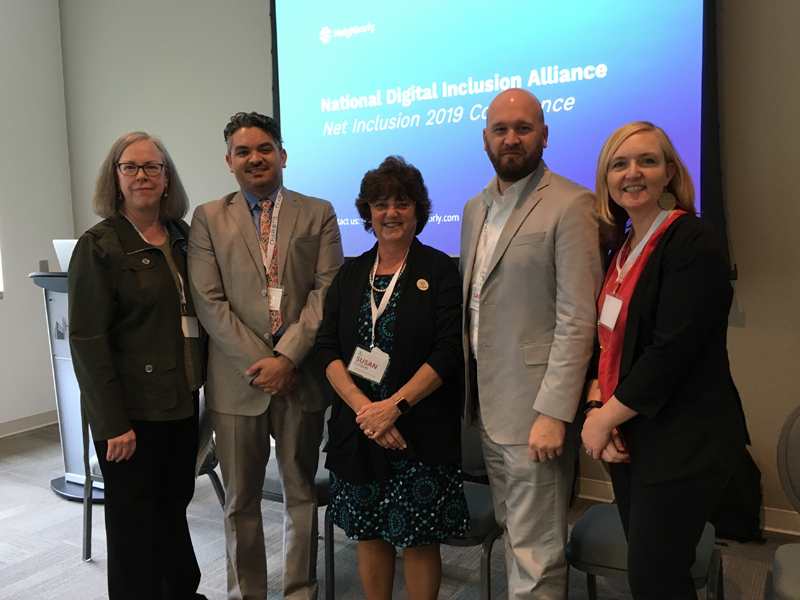 Organized by the National Digital Inclusion Alliance (NDIA), Net Inclusion is the only conference in the U.S. that is focused entirely on digital inclusion. The first session I attended was titled “Federal Policy’s Impact on Local Digital Inclusion: Current and Potential Agency Policies and Legislation.” It discussed federal policies on net neutrality, Lifeline, mandated discount internet offers, privacy, and spectrum. Speakers discussed how to leverage these policies at the state and local level and shared tips for advocating for affordability and digital literacy in relation to broadband infrastructure access. My biggest takeaway was that policymakers have to hear from organizations like CTN. Many simply don’t understand the problem and therefore won’t craft solutions to best meet the needs of their constituents. They also need to understand that low-cost options are a MUST since cost has been identified as a major reason why people don’t have broadband in the home. They organized sites visits at nearly a dozen locations across the city. I visited the following programs. Renaissance West STEAM Academy: Renaissance West Community Initiative (RWCI’s) mission is to promote a collaborative community centered on quality housing, education, health and wellness, and opportunity. Their vision is to end intergenerational poverty through a holistic community revitalization effort. RWCI opened a pre-K through 8th-grade school, Renaissance West STEAM Academy, in 2017 and jointly governs the school with the Charlotte-Mecklenburg school system. Goodwill Opportunity Campus: This facility offers access to technology, assessment, and testing, personalized mentoring and coaching, a warm handoff to strategic partner agencies located on campus, and expanded skill development capabilities. Digi-bridge at Ashley Park: Equip shareholders with the means to foster optimal use of technology in the learning environment, ensuring that all 21st-century learners have opportunities to succeed in the digital age. I was asked to speak on a panel titled “Diversifying Your Fundraising: Relationships, Planning, Grants, Grassroots.” I am pictured here with Adrianne Furniss, the facilitator, and fellow speakers Rene Gonzalez, Susan Corbett, and Sammy Lowdermilk. We all had unique perspectives to share. For CTN, our annual budget this year is $980,000, half of which will come from fee for service, 25% is government grants, and the remaining 25% is a combination of support from foundations, corporations, and individuals. The conference provided some participants the opportunity to get on stage and share information about their programs in a format called a Lightning Round. I was selected to speak and used my five slides and four minutes to highlight our work with partners. View the recording here. I’m always sad when the conference ends because it’s the only time each year when I’m surrounded by people who care as much, or more, about this issue. Luckily, NDIA provides opportunities for people to connect all year! Join as an Affiliate for free. Your organization’s name will be listed on the NDIA site, and you’ll be able to participate in the NDIA listerv. Better yet, become a Subscriber (sliding scale annual fee) and receive discounts to NDIA events and the option to participate in NDIA working groups and other issue specific work. Two representatives will have access to monthly NDIA policy webinars and special briefings. I encourage you to save the date for the next conference scheduled for April 7–9, 2020, in Portland, Oregon.